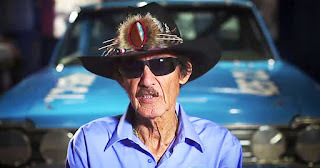 Today, Richard Petty, indelibly known by his moniker the King' turns 80yrs old, and for once in many, many moons, will not be celebrating his birthday at the Racetrack. Known as Roundy-rounds Greatest Racer, Petty who started a whopping 1,184 races spanning a 35-year racing career, winning an unprecedented 200 NASCAR Cup victories, retired from driving a quarter century ago, is still as popular today! As Richard Petty, in true cliché does transcend Sports, even having gone so far as racing in Roger's Backyard at 16th & Georgetown on multiple occasions, when "Gentleman John" (Andretti) piloted the iconic No. 43 three times between 2009-2011. John drove the #43 Windoworld entry as part of the Dreyer & Reinbold Racing's Indy 500 fold in 2009 before competing at Mother Speedway in association with Andretti Auto sport's multi-car Indy 500 Armada's from 2010-11.